Sen. Ted Cruz's citizenship saga could linger http://t.co/wB8Gem8RRq via @USATODAY – Is citizenship ownership or membership? 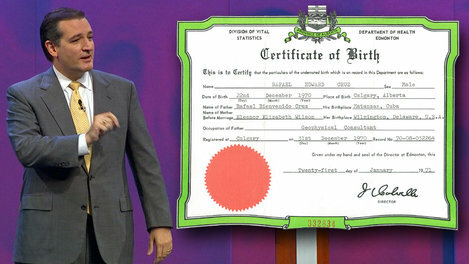 … showed Cruz was born in 1970 in Calgary, Canada. His mother, Eleanor, was born in Delaware and was a U.S. citizen and his father, Rafael, was born in Cuba. Cruz had said in interviews prior to his Senate election that he is a U.S. citizen because his mother was born in the USA. “Because I was a U.S. citizen at birth, because I left Calgary when I was 4 and have lived my entire life since then in the U.S., and because I have never taken affirmative steps to claim Canadian citizenship, I assumed that was the end of the matter,” Cruz said in a statement released Monday. Cruz will have to explain in writing why he doesn’t want to be Canadian, fill out a four-page form and get clearance from Canada’s spy agency, according to Reuters. The process could take up to eight months. This entry was posted in Are you a U.S. citizen?, FBAR and reporting, U.S. democracy, U.S. freedom and tagged Senator Cruz, Senator Cruz citizenship on August 21, 2013 by renounceuscitizenship.